At Influitive, your feedback is highly valued as it provides us with direction on the features we should implement to make your experience with the Hub the best it can be. Your feedback about pain points you experience and suggestions for new features are crucial to our product team. We welcome all feedback so don’t be shy and let us know what you would like to see in our products. 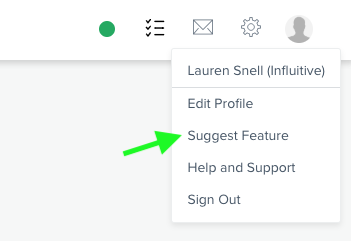 Suggestions for improvements can be made by clicking on your profile picture in the Admin View in your Hub, and then clicking the 'Suggest Feature' link. Doing so will take you to a Product Ideas Discussion forum in the VIP Hub. You’ll be able to add your own. When suggesting a new idea, please check to see if someone else has already suggested a similar feature. The Suggest a Feature form will automatically show other existing feature requests that are similar to yours as you type a title for a new request. The product team reviews the posts that have the highest number of votes first, so upvoting an existing post makes it more likely for the product team to see the feature you want! Don’t forget to comment your specific use case on the existing post to show your support for the idea, and demonstrate how the feature would be valuable for you too. The product team reviews the posts that have the highest number of votes first, so upvoting an existing post makes it more likely for the product team to see the feature you want! Don’t forget to comment your specific use case on the existing post to show your support for the idea, and demonstrate how the feature would be valuable for you too. The Product team reads every single post that is submitted, even if they aren’t commented on right away. 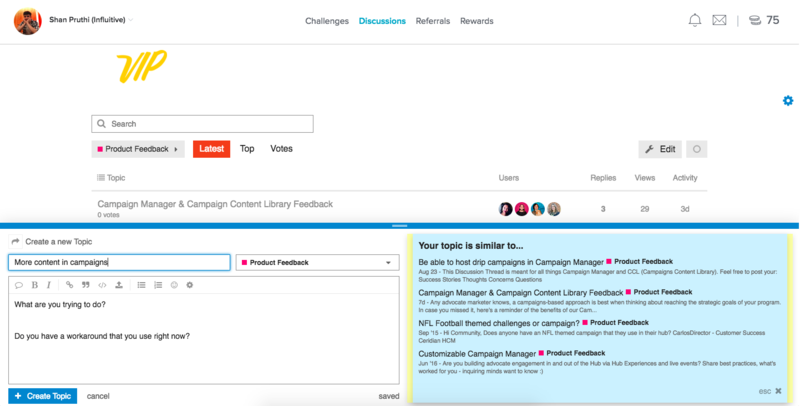 After posting your feedback request, it can be voted on by other users. An ideal post succinctly describes what it is you want to do, what your pain point is, how you currently workaround the issue, and the impact this problem has on your work. The clearer your post is and the more detail you have, the easier it will be for other users to understand the value of your request, making it more likely to be upvoted. You can vote on feature requests that you want by clicking “Vote” beside the title of the post. Remember to vote for the features you want to see - it will bring them to our attention faster. The product team at Influitive meets regularly to review requests. The ideas that are in the top 10% of customer requests are the ones that are discussed first. Our customer priorities, team member priorities, and strategy are all considered when planning new features. When a decision is made regarding an idea, our product team will do it’s best to reply to the topic in the discussion forum. The author, and anyone who has commented on, voted on, or is following the idea will be able to see the update. We will aim to have an explanation behind the nature of every response. Please note that there is no assured timeline or commitment that the request will in fact end up in our product. How long will it be before the product team reviews my idea? Posts on the VIP Product Ideas Discussion forum are actively monitored by our product team. Topics will be reviewed by product specialists once they're in the top 10% of ideas from our customers. Our product specialists review these top ideas monthly, so over time there's a good chance for your ideas to make it into these meetings. Make sure your ideas are clear and concise so others vote on it. My request hasn't been reviewed yet and I submitted it 6+ months ago. What can I do? Make sure your request is clear. Why do you need this? What is it stopping you from doing? What is the impact of that? Please add these details in a comment on your idea. Note: The VIP Hub always has the most up-to-date information about our products and what we're building next. If you reach out directly to our support team they'll be able to direct you to our Product News experience in VIP, but they won't have any additional information or provide an estimate for when your item will be reviewed. Thank you for your feedback, understanding, and support as we work together to build the best products possible!